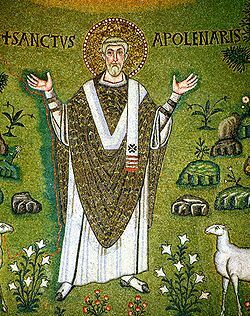 St Apollinaris was a native of Syrian Antioch. He was appointed Bishop of Ravenna in Italy by St Peter, a position he held for 26yrs. During his time as Bishop, he faced almost constant persecution including imprisonment, torture and exile. St Apollinaris was a notable miracle worker. He attracted many converts which in turn, created many enemies among non-believers. On his final return to Ravenna from Greece, having been exiled there for a fourth time, he was spotted passing out of the gates of the city and savagely beaten. He died from his injuries seven days later. Pray for us that we will show mercy to our enemies like God our Father in Heaven whose, “Mercy endures forever”.